Now that we're finally starting to thaw out, it's time to think about my favorite way to cook in the summer: GRILLING! I love to throw food on the grill. It's easy, clean-up is minimal, and it can be really healthy! Heat gas or charcoal grill. Cut 4 (18x12-inch) sheets of heavy-duty foil. Place salmon piece on center of each sheet. Brush 1/2 tablespoon oil over both sides of each salmon piece. Sprinkle each piece with 1/8 teaspoon salt and 1/8 teaspoon pepper. Place about 3 lemon slices flat or overlapping on each piece. 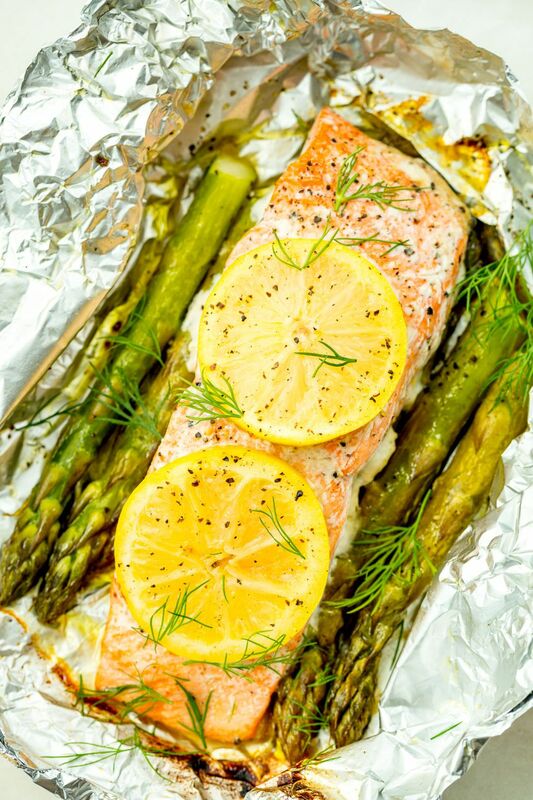 Bring up 2 sides of foil over salmon so edges meet. Seal edges, making tight 1/2-inch fold; fold again, allowing space for heat circulation and expansion. Fold other sides to seal. Place packets on grill over medium-low heat. Cover grill; cook 13 to 16 minutes, rotating packets 1/2 turn after about 7 minutes, until salmon flakes easily with fork. To serve, cut large X across top of each packet; carefully fold back foil to allow steam to escape. Sprinkle with parsley. You can add asparagus, squash, or zucchini in the foil, too! Just add it next to the salmon.